Bought at the top then stopped out on the drop! What in the world went wrong with my NZD/USD trade?! They say that hindsight is 20/20 and when I look at the chart above, I could clearly see where I went wrong. I was too excited to set my entry orders that I got faked out! Unfortunately, I couldn’t log into my trading platform during last Friday’s U.S. trading session so I wasn’t able to cut my losses when the U.S. retail sales release came in stronger than expected. With that, the pair slid all the way down to my stop at .8200 right before my eyes and put a 0.05% loss on my account. Clearly I’m frustrated with how I executed this trade and with how I was unable to access my trading platform right when I needed to. But oh well, it’s time to move on and bounce back with a good trade, right? With the FOMC statement coming up, the markets could present a lot of trading opportunities so hit me up if you have any ideas! What’s this I’m hearing about hints of an RBNZ rate hike?! Word through the forex grapevine is that Governor Wheeler is becoming more concerned about strong inflationary pressures and less worried about Kiwi strength! 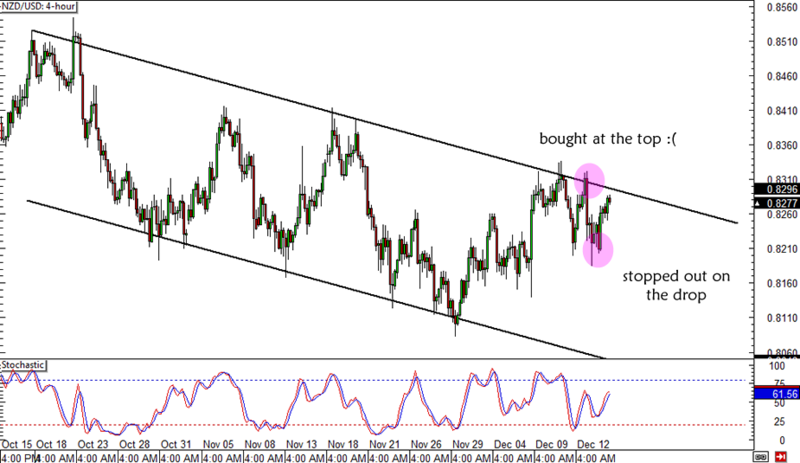 NZD/USD is still in a downtrend on the 4-hour time frame though, as the pair is trading inside a falling channel. 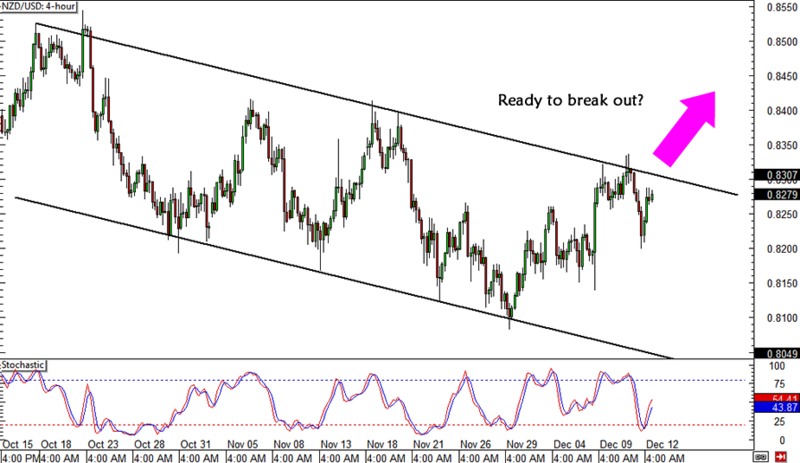 However, it looks ready to make an upside break and is already hovering around the top of the channel. I’m looking to enter on the break of the channel resistance or possibly on a quick pullback so I’ll be watching this one pretty closely. For now, I’ve got my eyes locked on the .8300 handle but I haven’t set any orders just yet. Stochastic just made its way out of the oversold region and is heading higher so an upside break looks very likely. I’ll also be on the lookout for the release of the U.S. retail sales report later, as strong figures might bring dollar strength back in play. After all, consecutive months of good NFP figures might lead to high consumer spending numbers. What do you think of my breakout trade idea?